To dehydrate anything, all your customers need to do is simply slice their produce, set it on the trays & forget about it for the next 8-12 hours! Because of the high-level safety features, they can even leave it on overnight and then wake up to a dehydrator full of dried goodness, ready to be enjoyed! Where the possibilities are limited only by imagination! You can dry almost everything including fruit, vegetables, herbs & spices, meat, ﬁsh – even ﬂowers! The market-leading Ezidri range offers the ultimate in food drying appliances, accessories & service. With three models to choose from, there’s one to suit everyone’s needs & budget. With Ezidri, your customers only get the best. Due to its huge drying capacity of up to 30 trays, powerful 1000W element & manual temperature control (variable from 30°C to 70°C) – with the Ultra FD1000, the possibilities are almost limitless! 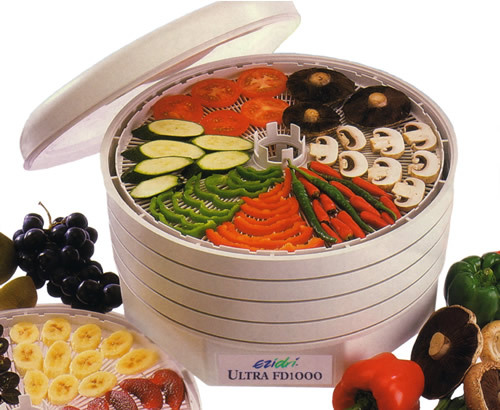 Designed speciﬁcally for bulk preserving, this semi-commercial dehydrator is second to none. The Ultra FD1000 is perfect for customers with a backyard vegie patch or orchard, access to large amounts of produce or for those looking to dry commercially.